I'm Adam Lee. For those of you who don't know me, I am part of the Magic creative team, the Izzet-like machine that works tirelessly to bring you worlds like New Phyrexia, Innistrad, andRavnica. I say Izzet-like because, at any minute, one of our heads might explode with the glee of creation. I'll be taking over this column for Jenna and I hope to bring a little bit of the fun, intrigue, and insight of the Magic story that she brought to it. Every now and then I also plan on pulling back the curtain on what goes on in the worldbuilding process here and how we come up with some of the stuff that eventually becomes part of the Magic story. For the most part, though, I will be telling you in-world tales that shine a spotlight on a little-known section of the myriad planes we create. The Izzet always had the best spells. Just because Kal was born to the Gruul didn't mean he couldn't appreciate ingenious spellcasting. He watched the Izzet for hours, seeing how they moved mana into multiple avenues, chaining arcs of energy in a chaotic dance. 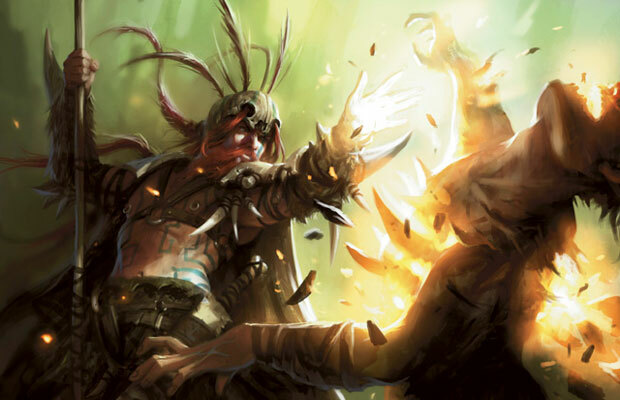 It didn't always work—they were the Izzet after all—and their failures were often more spectacular than their successes, which forced Kal to stifle his laughter or gasps of astonishment. His job was to watch them, and he had to remain hidden. But he learned something by watching the Izzet. He brought back radical ideas to his mentor, but his enthusiasm was not highly appreciated. Such methods did not belong in the shamanic traditions of the Gruul. But Kal would not be deterred. He knew there was a method to their madness. Every morning, Kal hiked along the Rubblebelt to climb a ruined spire of a long-abandoned Orzhov cathedral so he could gaze into the recently acquired Izzet industrial zone. Strange apparatuses, steaming pipes, and inexplicable holes were everywhere. Kal had no idea what they were researching but he found it fascinating. 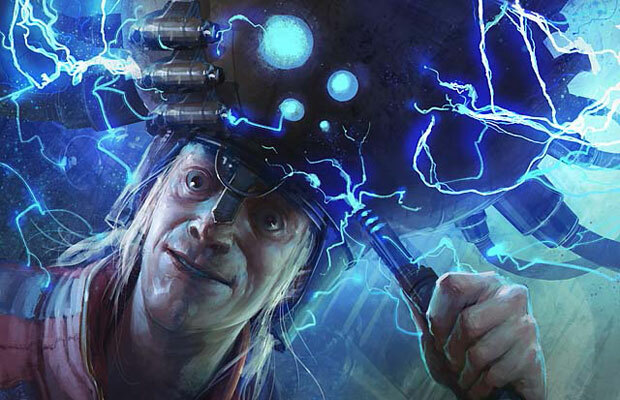 He watched the Izzet chemisters and guildmages summon huge hyper-voltaic weirds to bore holes and power machines. Occasionally, Kal heard a loud pop from one of the numerous goblin assistants that wandered too close to the enormous weirds and were flash-boiled in the creature's powerful mana-fields. This often prompted a spontaneous goblin game of "shove and pop"—which was not approved by the chemisters. Kal was sent to watch the Izzet by his clan leader, Nikya of the Old Ways, to make sure the Izzet didn't move into Zhur-Taa territory or, worse, disturb the gods their clan believed lay sleeping under Ravnica. Although Kal was a shaman, all Gruul were raised as hunters, so his ability to move silently and stalk prey far more attentive than the Izzet made this assignment an easy one. But Kal also showed signs of having a sensitivity to magic that few of the Gruul shamans understood. He could sense the strange magic of the Izzet, its frenetic, crackling, and unpredictable energy was something Kal could feel as if he were immersed in it. He liked the excitement and uncertainty that was in every Izzet spell and he sat on the vine-covered balcony, silently observing the manic work of the Izzet mages, watching the way they moved mana. The young shaman absorbed it all well into the evenings amid the deep thrum of the Izzet manacoils. Durri, a young scout from the Zhur-Taa, sat with Kal on a crumbling wall overlooking a weed-choked pool of water. She picked meat off a grouse she had caught and cooked earlier and talked to Kal through mouthfuls. "It was that Selesnyan camp that got attacked. I hear there was blood everywhere. Dumb Selesnyans. Welcome to the Rubblebelt." Durri flicked a bone over her shoulder and stuffed in another mouthful. Then, as if remembering, she offered the carcass to Kal, raised her eyebrows, and nodded. Kal refused. "The healer's camp? Are they okay?" Kal knew some of the Zhur-Taa made use of the Selesnyan healer's camp in the Rubblebelt, but something had happened to make Nikya distrust them. "I think most of them are dead. Ogreth said it was the Rakdos. He told me that Nikya looked so mad she could crush stones with her teeth." Durri smiled at Kal with a glint of fire in her eyes. "It's gonna be war." Kal looked into the pool, taking in Durri's choppy, obstructed speech. He tossed a pebble from the wall into the water and scared a frog. "You ever been to war?" Durri wiped her nose with the back of her tattooed hand, then scratched her dark hair pensively. "Not real war. Been on a few raids. Wrecked some stuff. Shot a few Golgari... things... whatever they are. Always wondered what it would be like, though. I've heard the stories." "Yeah, me too." Kal imagined hurling a ball of fire into the middle of some Rakdos thugs, which only made Kal want to practice magic more. He wanted to prove himself. All Gruul wanted to prove themselves. Kal was still picking the burrs off a grumpy dromad when the war-party returned. He could feel the tension as they came up the ruined causeway. Nikya called, "Zhur-Taa, gather!" She dismounted from her beast and climbed up the stone blocks of the Speaking Mound. Nikya looked grim as she sat down, cross-legged. A thrill ran through Kal as he felt a shift in his clan. He sensed something big was about to happen. Kal climbed up on top of a small boulder and watched as his clanmates came together, a wave of murmurs running through the warriors. When all were assembled beneath her, Nikya spoke. "Blood has been spilled. Innocents have been slaughtered. Our territory defiled. 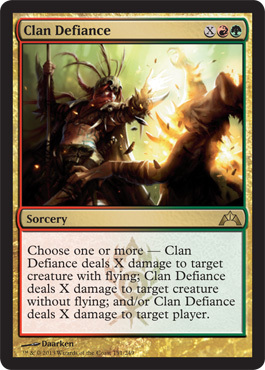 Under our laws, we have the right to claim bloodcrime and seek vengeance from the Rakdos." Upon hearing those words, the clan roared in approval. Much pain had been caused by the Rakdos out in the Rubblebelt, and even as far as the Utvara. 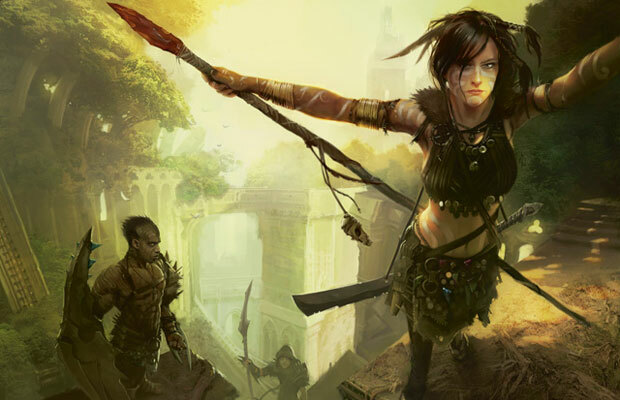 The thrill-killers and murder-gangs filled their lust for blood out in the lawless zones of Ravnica, away from the eyes of the Azorius and Boros—areas the Gruul claimed as their own. Nikya held up her staff and the cheering ceased. "The Rakdos are few in number but they are led by a monster who wanders the 'Belt in search of easy prey like the Selesnyans. We must catch them before they get back to their nest of devils. We must claim our vengeance." Zhur-Taa cheered, raising their weapons and holding them in the air, awaiting their clan leader. Nikya came down from the Speaking Mound, moving like one of the great maaka that prowled the 'Belt, and began to touch the upheld weapons—choosing her war-party, as clan leaders had done for thousands of years. Kal saw Durri kneel to the ground in honor as Nikya touched her raised sword and hoped he could fight alongside her. It seemed like ages until Nikya passed close to the boulder Kal knelt upon, but for all his desiring, her hand never touched his outstretched weapon. "Ready yourselves, Zhur-Taa," Nikya commanded. "We go now, on foot. 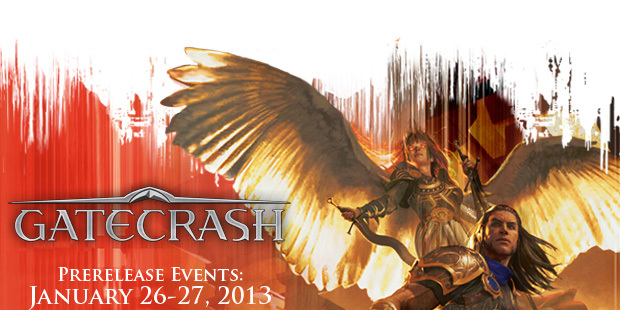 Let's hunt some Rakdos!" Kal tracked the war party from a distance. He knew the Rubblebelt well but keeping up with the Zhur-Taa warriors without being detected taxed both his skill and his nerve—if he was found out, it could mean banishment or death. But every time Kal started to turn back, he thought about Durri rushing toward a horde of Rakdos spikers and it made him push onward. He could not abandon his friend. Kal kept his distance and couldn't see his clan, but he knew they were close. The Zhur-Taa were moving silently and had left their massive beasts behind in order to ambush the Rakdos, who were usually noisy, disorganized, and distracted. As he hastily clambered over a stone to round a massive heap of a building, he faced a spear-point leveled at his head. "Krokt!" A warrior named Janik hissed at Kal. "I almost skewered you. What are you doing here?" Janik grabbed him like a vise. "Nikya will put you on a skewer, boy. You have broken—"
A shout rang out, followed by the roar of Gruul warriors. Janik swore and let Kal go as a fiery blast illuminated the dusk and silhouetted the nearby towers of rubble. "Deal with you later," Janik said. He shoved Kal to the ground and sprinted off toward the fight. The bellows of Rakdos ogres filled the air along with Gruul war cries and howls of pain. Kal ran after Janik, leaping over fallen beams and ducking under collapsed masonry as he picked his way through the ruined streets. A blaze of fire shot over his head and struck a gibbering devil a few yards away. It screamed and cackled madly as it writhed on the ground. He could then see the entire melee. Nikya stood, chanting, on a pile of rocks. 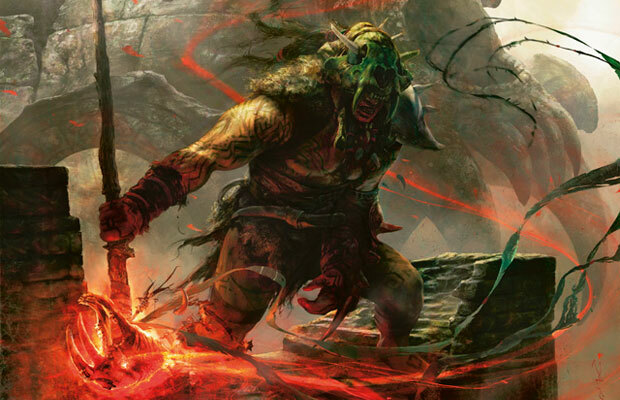 A huge wall of vines entangled a massive Rakdos ogre, who roared in anger and tore at it like a frenzied beast. Rakdos were everywhere, pouring out from the cracks and holes of the rubble like ants, and Kal's head swiveled frantically as he searched for Durri. His clan looked to have the upper hand. Gruul warriors chanted ancient songs of war as they smashed gibbering imps and shred-freaks into ragged heaps. Kal saw a flash from a derelict building and caught the outline of a bloodwitch. He had heard rumors of the chosen of Rakdos, mages who held the full power of Rix Maadi in their grasp. Kal had no idea why a bloodwitch would be here, but he knew it was more than Nikya had accounted for. He heard nearby screams as a handful of goblins glowed with a red-light and then crumpled into a sickening ball, as if crushed by an invisible hand. Then he could smell it—the foul, spice-like odor of demons. "Demons!" he heard one of the Zhur-Taa scream as massive, wet claws erupted from the earth. Stone and dirt were pushed aside with unholy eagerness as the slick, batlike demons rose with a deafening roar and a wave of overpowering stench. "Zhur-Taa! To me!" Nikya cried, peeking over the thundering wings of the demons. 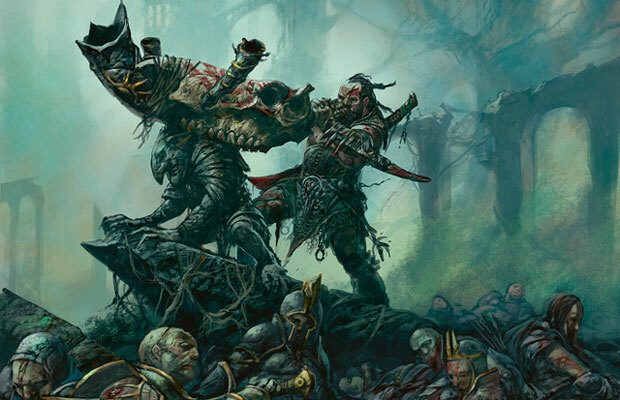 Gruul warriors began to appear out of the gloom and smoke, fighting their way back through the Rakdos. Kal looked for Durri as he ran to his leader but something grabbed him by the ankle and sent him sprawling. A gash tore open his leg and he ate a mouthful of dirt. A flailer had hooked him. The grappling chain sunk deep into his thigh and he felt himself dragged toward the masked ogre. He struggled but he couldn't think straight. Every pull on the chain sent a bolt of pain through his body. "Kal!" Durri's voice called his name from somewhere. "Kal!" The flailer mocked, hauling him closer. Kal's mind raced. There were too many Rakdos. Too many demons. A flash of insight occurred to Kal. The hours of watching the Izzet wield magic. The way they allowed electricity to scatter and arc. He could feel rage and desperation burning within him like a fire. Like the Izzet lightning. Fire and lightning were similar. They were both raw and chaotic. A blast of fire incinerated the grinning flailer. His arms and legs flew apart, leaving spiraling trails of smoke in the air. But that was not the end. Arcs of energy flew from Kal and plowed into the demons like a blazing hammer that turned them into shrieking plumes of fire. The fire from the demons then overflowed and bolts of flame scorched the earth, reducing the rest of the Rakdos to bone and ash in a blinding flash. When he awoke, Kal was looking into the steel eyes of Nikya. "Did we get her?" Kal croaked. "The one they call Massacre Girl," Nikya said with a snarl. "No sign of the wretch's corpse. But you got one of these with that spell of yours." Nikya held up the bloodwitch's charred head. "A good prize." Nikya leaned closer. "I have been wielding the magic of the Gruul longer than you have been alive, Kal. What was that? Where did you learn such a spell." "I don't know what that was," Kal replied. "I think I learned it from watching the Izzet." Then Durri leaned in, smiling. "You may have learned it from the Izzet, Kal, but look around." She made a sweeping gesture. Kal could see the smoking corpses of Rakdos strewn about like twisted puppets. "It sure feels like Gruul to me."